Ok so I'm a gadget freak, but in my quest for simplicity, I was not happy lugging both a briefcase AND a lunch bag...there had to be a better way. 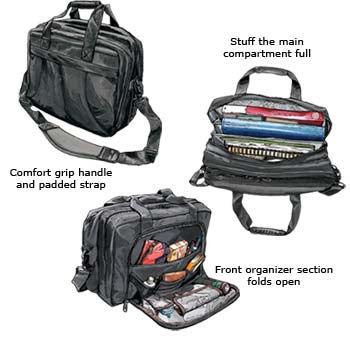 Then I happened upon Duluth Trading's Combination Briefcase/Lunch bag in one !! Was this too good to be true? Only one way to find out...yes indeed!! It does both: lugs the ugly laptop and keeps the gutload chilly 'til lunchtime. Can it get any better?? Folks love our go-everywhere, do-anything Briefcase Cooler. But a few of them came to us with a slight warping in the inner divider pocket on the briefcase side. It doesn’t affect the function and no one will notice but you. And talk about a great price on all the function of Fully-Evolved Briefcase and Louie’s Lunch Box combined! Briefcase side has a main compartment with three file sections, plus a three-sided zip closure section in front with pockets for eyeglasses and sunglasses, a cell phone, pens, PDA and all your essentials. 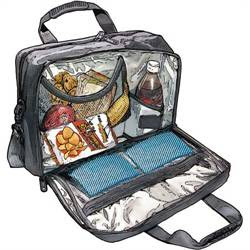 Lunch box side is a PVC lined cooler with a mesh sandwich pouch, thermos strap, pouches and mesh pocket for two ice packs (included). Made of rugged, abrasion and water-resistant 1200-denier polyester. 17½"W x 12"H x 7½"D. Imported.